Toccata & interlude : for piano solo / Ann Carr-Boyd. Includes brief programme and performance notes, and biographical notes on composer. 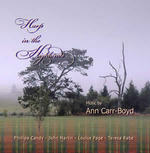 CD: Harp in the Highlands / music by Ann Carr-Boyd.